An intravitreal (into the vitreous cavity) injection is a way of delivering medications to the retina in the back of the eye. Certain medications will not reach the retina if given as eye drops or pills, and therefore needed to be injected directly into the eye. 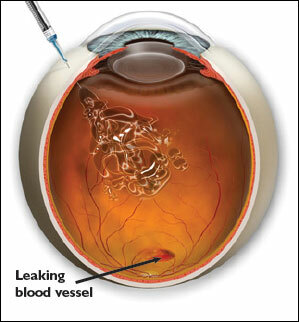 Intravitreal injection is a procedure typically performed when fluid has built up either in or under the retina. Common medications that are injected include Avastin, Lucentis, Eylea, Dexamethasone and/or Kenalog. Dr. Blem will discuss with you which specific medication is recommended for your condition and why it will help your vision. Avastin, Lucentis and Eylea are a certain class of medication called Anti-VEGF. Vascular Endiothelial Growth Factor (VEGF) is a local hormone that is released in the tissues that causes blood vessels to become porous (allowing fluid to leak) or to grow new blood vessels (abnormal vessels). Both these medication are used to stop fluid and/or blood from leaking out of blood vessels, which is a common occurrence in both wet macular degeneration and macular edema. In wet macular degeneration, Avastin, Lucentis or Eylea is also used to prevent the growth of abnormal blood vessels under the retina. These abnormal blood vessels leak fluid and blood and are very damaging to the retinal photoreceptors. Dexamethasone and Kenalog are anti-inflammatory medications. When tissue becomes damaged, it has a natural inflammatory response. Long-term inflammation causes damage, and both medications are used to reduce the inflammation within the retina and under the retina. First Dr. Blem will place several local anesthetic drops in the eye over the course of several minutes. Following this he will clean around the outside of the eye with an antiseptic solution. After allowing a few minutes for the cleaning solution and anesthetic to take effect, your doctor will inject the medication through the white part of your eye with a very small needle on a tuberculin syringe. In almost all cases the anesthesia eliminates any sensation of pain. Some patients may feel pressure with the injection. They may also notice a graying of or blurry vision for 5 minutes after the injection. On very rare occasions, a very quick pinching sensation or pain may be felt. Your eye will probably be sore and your vision somewhat foggy for a day or two, and then should improve. Any discomfort can often be relieved with Tylenol or Advil. A cool, clean washcloth held gently on the closed eye (for no more than 10 minutes every half hour) can also provide relief. Sometimes the needle breaks a blood vessel on the surface of the eye at the time of injection. This can cause the white of the eye (sclera) to look red for as long as two weeks. If the eye is red, but is painless and the vision is good, then it is most likely harmless. The most important risk of the injection is an infection inside the eye. However this is a very rare complication occurring in much less than 1% of injections. Other rare complications including bleeding inside the eye, cataract, glaucoma and retinal detachment. More common side effects include mild irritation and a temporary increase in pressure inside the eye. Moving circular black spots in your vision (floaters) may be noticeable immediately following the injection and can last up to 24 hours. A small red area or hemorrhage at the site of injection is also commonly seen in the first few days after injection. This occurs as a result of a capillary being punctured and is nothing to be concerned about. It is similar to a bruise on the outside of your eye, and will resolve completely over 1-2 weeks. What would be the symptoms of an infection inside the eye? The symptoms of an infection inside the eye include severe eye pain that doesn’t go away, a large drop in vision and a severe red eye. (Mild irritation and redness on the white part of the eye are normal after the injection, especially in the first day.) If you have any of these symptoms or if you are concerned you should call Dr. Blem the same day for further evaluation.